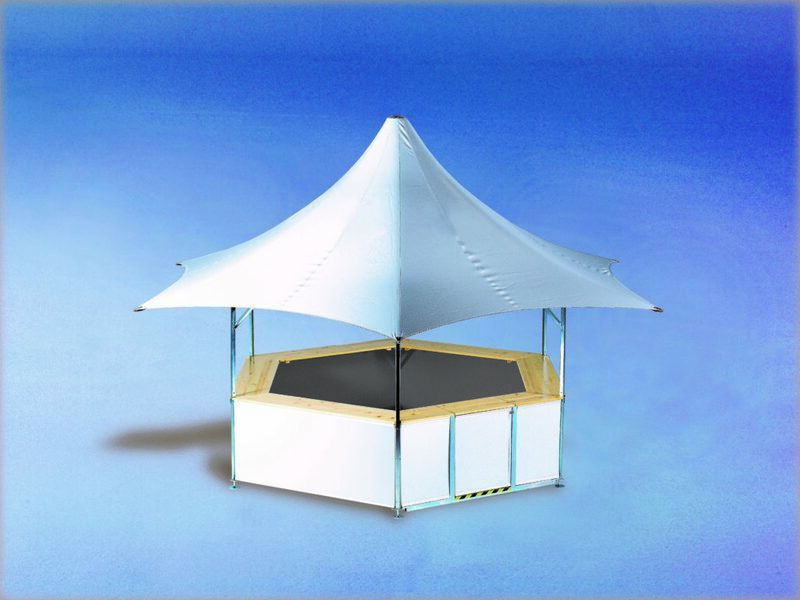 The newest, but also our most prestigious, high-class pavilion in the range, is the Star Pavilion based on the Hexagonal Pavilion. 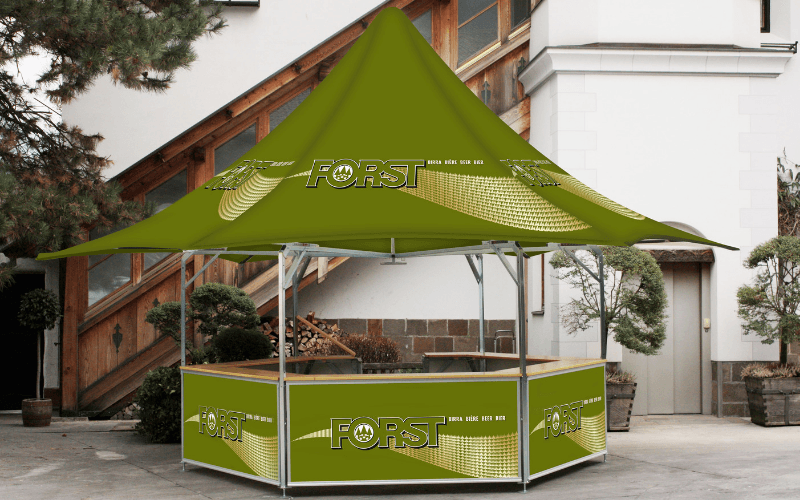 So, if you are looking to introduce an elegant look to your outdoor event bar offering, the Star Pavilion could just be right for you. What makes the Star Pavilion unique and individual in look is the extended canopy and high peak roof frame, which creates the star shape. The star-shaped roof gives it a light-flooded modern appearance. Like all other Pavilions it can be assembled and dismantled in no time at all and transported around in the specially designed transport containers. 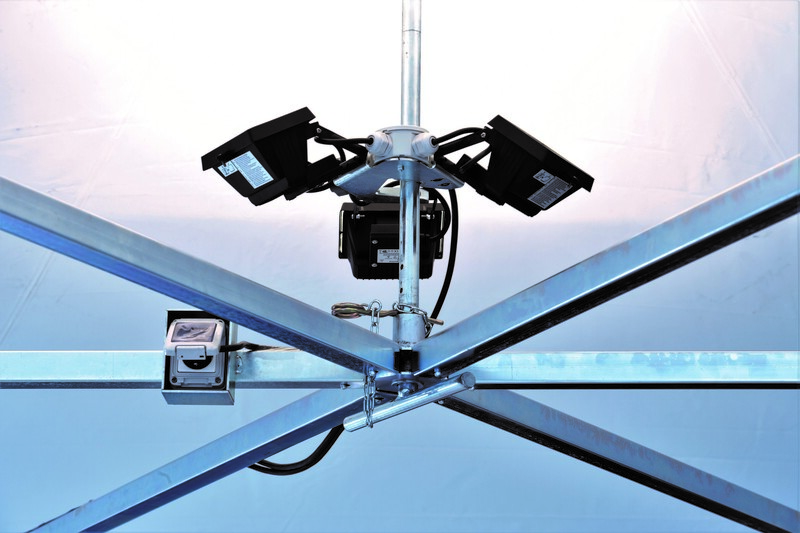 (See General Information for further details on set-up, storage etc). Like the Hexagonal Pavilion it is generous on space both inside for people working and serving as well as for customers on the outside, comfortably accommodating 24 people as standard, which increases to 42 if counter extensions are fitted (see Accessories). Additionally, inside also has plenty of space to house drinks dispensing equipment, cash tills, merchandise etc, whilst still enabling a number of people to serve customers from all 6 sides enabling management of crowds around the outdoor bar or merchandise stand. 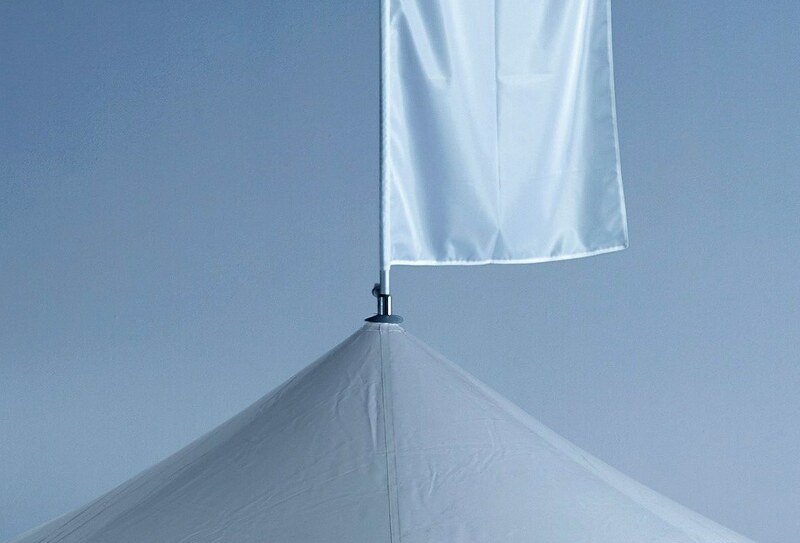 Like all other Pavilions in the range, the Star Pavilion can be adapted for different events or venues, but being our most prestigious, high-class in the range it is particularly suited for high-profile events or venues. 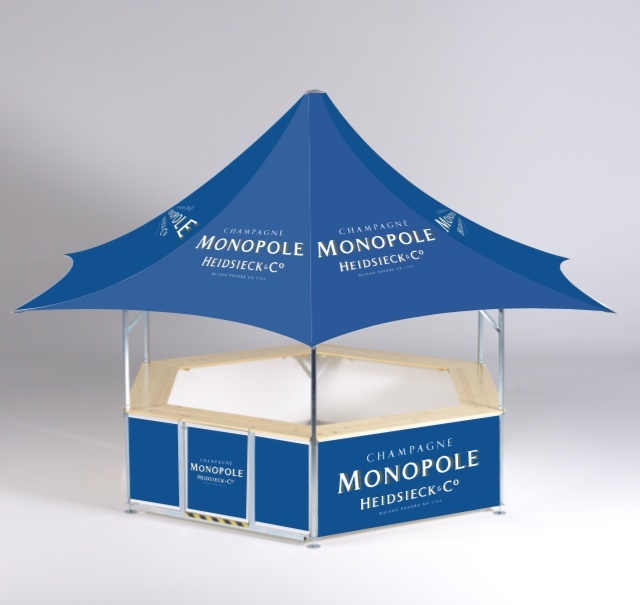 It will create an ambient setting and is perfect as a an event bar for racecourse champagne lawns, polo events and similar top-class occasions, but will not look out of place as a wine & spirits branded bar, draft beer bar or a sampling stand. Regardless of how you decide to use the Star Pavilion it is sure to create impact and stand out for all to see and admire. 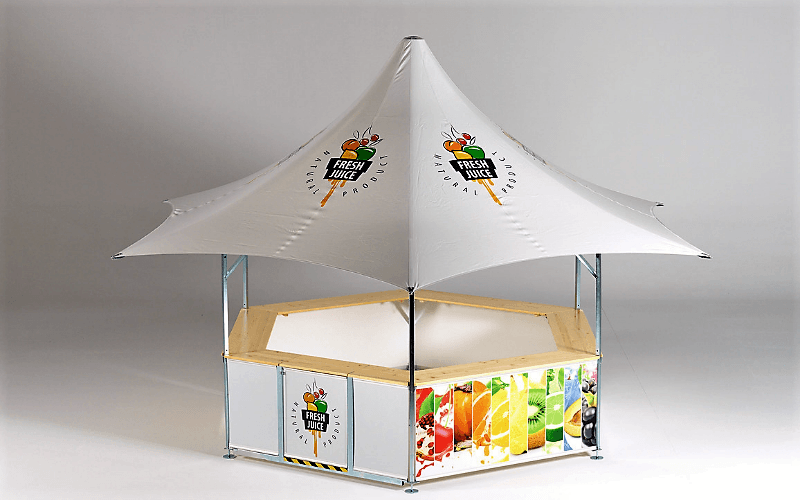 The roof can be fully or partially digitally printed and base panels can be fully or partially printed with corporate branding or promotional messages of your choice. There are 10 standard colours for the roof, with other colours available on request. See General Information for details. 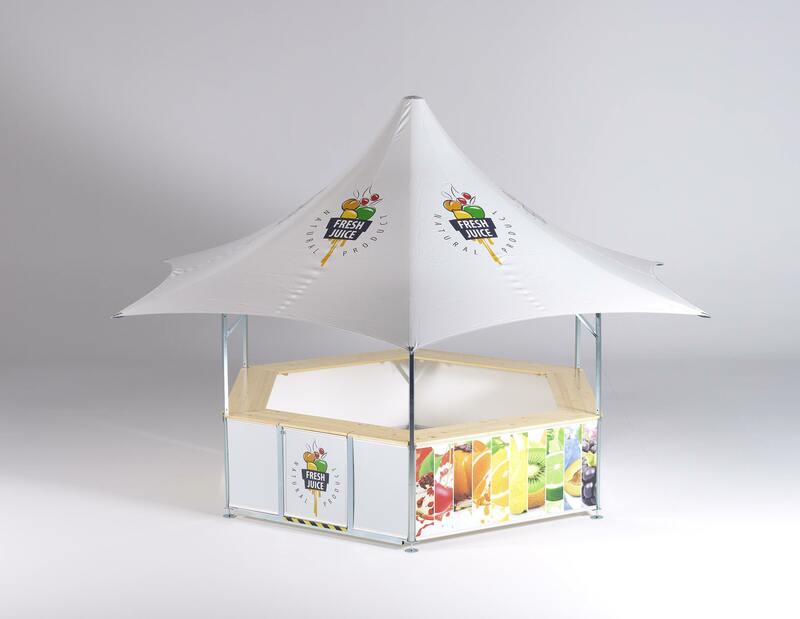 If you are looking for an elegant yet versatile portable outdoor event bar solution for an event, festival, racecourse or other open-air occasion, then maybe the uniqueness of the Star Pavilion is the best solution. Contact us today to discuss your requirements and we will recommend the best solution from one of our range of Event, Mobile & Stadia Bars to match your budget and expectations.